There are a considerable number of Asian-food restaurants along the Brunswick stretch of Lygon St. Gingerlee, the Alderman and Rumi might be getting all the press, but Thaila Thai and Kake di Hatti are serving up crazily well-priced meals, and on the other side of the road Singhs and My2K, to name but two, go big on dining space and menu choice. Amongst all of this is Satay Anika, a Malaysian restaurant. In the middle is a fitting place to be: Malay food takes a mix of Indian, Chinese and Singaporean cuisine to create its own strand of spiced dishes and sauces. The eat-in menu here doesn't extrapolate much on the dishes (the takeaway menu is more informative), but help is at hand from the floor staff (the chef gets out and serves as well so there's plenty of information available). 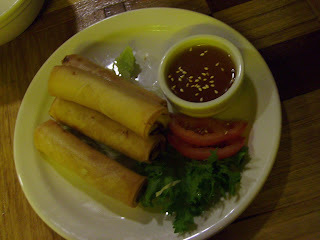 An entree of plump vegetarian spring rolls was increased to four portions from the normal three, so that we could have two each. The rolls were super hot and crispy and came with an acceptable plum sauce. Although not elaborated on the menu, our effusive waiter informed us that the Anika chicken involved deep fried chicken pieces with a plum sauce. Which it did - certainly no artifice in description but some veg would have been a welcome distraction in addition to the sesame seeds. It delievered more than expected, however. The batter was thick and crunchy and teamed up happily with the sweet, sticky plum sauce. 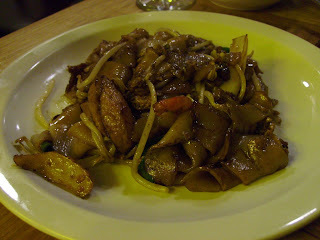 Char kuey teow, a Malaysian favourite, had a longer ingredients list. Wide rice noodles coiled amongst baby prawns, beef, egg, tofu and bean sprouts, along with a mixture of oyster, mushroom and kecap manis sauces. It was a satisfying meal, but again, some wok-fried capsicum or baby corn - something adding colour to the dish as well as flavour and texture - would have lifted it further. Serving sizes weren't huge, and with the WYSIWYG approach to assembling the dishes I felt slightly let-down. The high turnover of takeaways on this Friday night and the steady filling of the small dining space, however, demonstrated that straightforward and reliable meals are often just the ticket to bring in the locals. The service is extremely friendly and welcoming and it's a comfortable setting in which to eat. The quality of the food is fine and the prices are more than acceptable: most of the menu standards hover around the $12 mark. Mmm, I'm a sucker for anything Malaysian, so this was a welcome tip. I don't catch the tram up your way often enough! It's such a great strip - Lygon St between Brunswick Rd and Albion St. And now, with George Calombaris moving in, it's about to get a whole lot more attention! king in newmarket for authentic Curry Laksa. I'm not sure of the etiquette when commenting on blogs but I would like to correct the blogger on a few points. Firstly, Malaysian food is certainly comprised of Indian and Chinese influences (the population demographics sit at 30% Chinese and 10% Indian and 60% indigenous Malay) however, the influence of the indigenous Malay is larger than that of Singaporean - Singapore is an island off the Malay peninsula. The fusion of Chinese and Malay cooking provides some of the best examples of Malaysian food and is known as Nonya (or Baba Nonya) of which Laksa is probably the most popularly consumed example. Secondly, the inclusion of vegetables in many asian meat dishes is a reflection of western tastes. When ordering in a more authentic asian restaurant vegetable dishes are generally ordered separately from meat. Although, there are many meat dishes that will include vegetables, but the vegetable will usually be included in the name of the dish e.g. beef with gai lan. Therefore, when ordering in asian restaurants it can generally be assumed that unless otherwise stated in the title and/or description a meat dish won't come with vegetables. Following on from this the Char kuey teow at satay anika contains ingredients not usually included in the dish. Generally when served in Malaysia it simply consists of Flat rice noodles, prawn and or clam, egg, chinese sausage, bean shoots and the green tops of spring onion along with the sauces mentioned. From Satay Anika, I would recommend trying the Beef Rendang - this is an excellent example of what this dry curry should look and taste like, also the green peppercorn chicken curry is very good - it also comes with a liberal amount of vegetables. I also recommend getting these curries with coconut rice. Thanks for your excellent comment. That's really useful information about the origins of Malaysian food and also about how we should expect it to be served traditionally in restaurants. 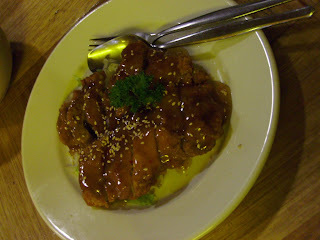 Thanks also for recommendations about particular dishes at Satay Anika. I'm sure we'll be back there and I'll look out for the beef rendang. Hi guys...I'm frantically looking for an Indian-chinese restaurant in the city--you know, Chinese food with an Indian twist, style, etc...I know there's one somewhere in/around the city but don't remember it for the life of me!! I'm dining out with a friend on Friday night, and I promised her!! Help!!!! Eek, nothing's springing to mind, sorry! If I think of anything before Friday though, I'll comment here. Thanks for that Foodiefi...apparently there is a place called Namaskar on Glenferrie Road that does serve Indian chinese..Ill see if I go there...the history of the Chinese Indian connection is quite fascinating..India has a tiny Chinese population, predominently Cantonese and Hakka. As a child, all beauty salons, almost as a rule, were owned and managed by people of Chinese origin, with the most popular salon in my area called, not surprisingly, Lee!! Also, chinese children always topped the class!! I remember thinking that as long as you have Chinese children in class, its a given that they WILL top!! Chinese food in India is extremely popular and prevalent, from five star hotels to road side stalls specializing in it. For a long time, the only non-Indian cuisine served in India was Chinese!! Eating out for us meant eating Chinese food, and how we loved it! Its quite different from 'authentic' Chinese cuisine, because it has been Indianized to a large extent. The use of typically Indian spices like cardamom, cloves and turmeric and ingredients like yoghurt and curry leaves is common, giving it an unmistakable Indian twist. I do recommend that you try it sometime--once I figure out where a good indo-chinese restaurant is, that is!! Will keep you posted! Meanwhile, happy eating!! Hi Dipa. That's really interesting info - thanks so much! Definitely let us know if you find the place in the city you were thinking about or any other restaurants around town that do the indian-chinese combination well. This post has turned out to be really informative! Got it!! 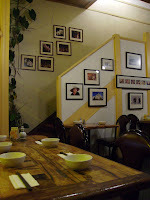 Namaskar India at 20 Glenferrie Road offers Indo-chinese cuisine..and its excellent!! Food was good, portions reasonable, and service efficient. The food is spicy, so be forewarned! They have another branch in Carlton, which certainly must be skipped - fails on all counts its cousin in Glenferrie excels at. Must try! I went to this restaurant tonight and have to say we were very disapointed, the food lacked zing. It was very oily and we could not identify what was in our seafood noodle dish. I am sorryhope this does not offend as I am not usually that blunt or rude however Mr M and I will never be returning to this establishment. Try Mumbai Hakka restaurant in West Footscray. They specialize in indo-chinese cuisine and i can vouch for the taste. It tastes exactly the same as you will get back in Mumbai!